Having eight hours of sleep each night is the easiest way to make your teen’s health in good condition. We should make the teens sleep in their recommended hours because about 1 in 10 of the teens gets the sleep they need each night. Sleep is a state that is characterized by altered consciousness, and reduced interaction with surroundings in the room (Harvard Medical School). “Scientists whose jobs are to find out what sleep is has found out by exploring changes in depth, and their definition of sleep was tied to the patterns of brain waves and other physiological functions in the brain. Even though the body of a sleeping person may look inactive, some functions in the brain and body are more active when you are asleep than when you are awake” (Harvard Medical School). We think sleep is very important to our health because sleep helps some parts of our brain be more active. Skipping sleeping not only harms your long-term health but actually makes it less likely that you'll retain all that knowledge and practice from the previous night. Sleep plays an important role in keeping your health and body in good condition. 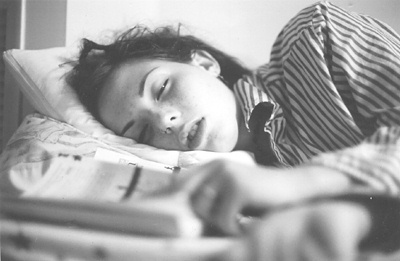 Teens are mostly recommended to sleep for 8 to 10 hours of sleep every day to be in a good condition to go to school. One study that was researched by scientists found out that 15% of the whole age groups between 13 to 17 years of age are sleeping for 8 hours and 30 minutes on school nights (National Sleep Foundation). Having to follow their school's homework and schedule, the teens are having irregular sleep patterns as the day goes by. In the weekends, some teens tend to stay up late and sleep in late. These irregular sleep behaviors can affect their health and their clocks inside their brains. In a study, it was said that “Over 90% of the teens in the high school in America are suffering from sleep-deprivation” (National Sleep Foundation). The National Institutes of Health says, “Teens need at least eight hours of sleep each night, and only 9% of the students were actually meeting the recommendations that were supposed to be achieved” (National Sleep Foundation). I agree on with how teens are getting less sleep than they are supposed to get. As you can see, I'm 13 and I've been sleeping for 7 hours each night. It is mainly because of homework and other academies that I have to go after school. Most of my academies end at 9:00 pm, and I need the time to do my homework for school tomorrow. After I finished adding final touches to my homework, it will already be 11:00 pm. Having to sleep for 7 hours every day has always been a daily routine for me, and it didn't really have a worsening effect on my health. I was shocked to find out that teens my age needed to sleep for 8 to 10 hours every day. Every day, teenagers are facing a huge responsibility on their homework, and other things that give them pressure. Teens are at an age of being more independent and at the age of making their plans for their future. Sleep is the thing that makes all of these things to happen. Having a good night sleep is beneficial to the teen's development and their growth as they get older. Teens are not getting the sleep they are supposed to get. Their busy schedules, schools, and homework put teens to have a high rate of having to lack sleep. According to the research made by scientists, 15% of the teens are getting the right amount of sleep they need every day. With teens who are short on sleep, they face challenges to their own health and their ability to learn at schools. Chronotypes modify when you grow, especially during when you were just a little child and adolescence. The internal clocks in teens run on different bio time than adults' clocks would. There is a biological shift in teens' brains that makes them be more active rather in the night than in the afternoon. Teens with their biological shift in their brains are put into pressures with schedules and early morning school start times. Teens are at an important stage of growing up and developing. They are so full of life inside them. One research showed that teens, who are at an important stage of growing, are suffering from a lack of sleep. Teens who are aged 13 to 19, need about 8 to 10 hours of sleep each night. Many people might think to have 8 hours of sleep was a long period of time, but eight is the minimum. To teens on the age from 13 to 19, having to sleep for 8 hours was so far beyond their reality. About 4 in 5 of the teenagers are getting less than 9 hours of sleep every day. Surveys revealed that teens are getting an average of 7 hours of sleep. The actual amount of time teens need to sleep are about 8 to 10 hours, and having an average of 7 hours of sleep is way below than the amount of sleep they were supposed to have. “Teenagers have to restore the things they learned during their hours at school, home, and academies” (AboutKidsHealth). When the brain is well-rested, it can learn and remember new resources and information. It can also enjoy the day more than a tired brain would. When teens sleep, inside their brains, there are some parts that are active and help memorize things more easily. Teenagers who get a good sleep every day can be more creative, can concentrate longer, able to make good decisions, and are able to learn new pieces of information they learned in that day. Sleeping impacts your health and in every area of your daily life. Sleep is needed as much as the way you need to eat, drink, and to breathe. Sleep plays a role in encouraging physical health, longevity, and being healthy. After you had a good night sleep, this explains why your thoughts and minds feel clearer after you sleep. Doctors urge you to get enough sleep, and having less time to rest has a negative impact on your health. “Some short-term problems can include lack of alertness, impaired memory, and relationship stress. Long-term health problems can include high blood pressure, diabetes, heart attack and stroke” (Brain And Spine). Having less time sleeping can even affect how you look. You can have wrinkles and dark circles under your eyes. Scientists found out that having less sleep can lead to an increase of stress hormone, cortisol. “Cortisol is a hormone that breaks down collagen, which is the protein that keeps our skin smooth” (Brain And Spine). Sometimes, teenagers can suffer or have sleep problems from not having the right amount of sleep they actually need for their age. “Some sleep problems that can happen to the teens can include taking a long time to get to sleep, repeatedly waking up in the night, refuses to get out of bed in the morning, having sleepwalked during the night and having continuous nightmares during sleeping” (Brain And Spine). Some sleep problems that can happen in the daytime are when the teen has very little energy, having naps for long periods of time and when he/she cannot concentrate at school. These sleep problems can rather be a temporary one for the teen, but still, teens should sleep for at least 8 to 10 hours each day to not get these problems in their life. The solutions to teens having less sleep can include having naps, make your room cool, don't have pills, and don't eat within a few hours of your bedtime. If the teens can't sleep to 8 to 10 hours because of school, then there is only one way to solve this problem, and that one way is to make school start later then they used to. We can stop teens from having a lack of sleep from keeping a diary or a list, by jotting down notes before you sleep, so it will not stress you that much. You can change your sleep schedules by participating in activities and class that will help act against your sleepiness. You can also try taking a bath or a shower at night so that you have extra time in the morning. There are some things that the teen's parents can do to stop them from not having the sleep they need. Parents should allow teens to save some sleep for studying for the test or doing their homework in the night. In researches, it was shown that teens who are awake in the middle of the night to do a homework is likely to have troubles with their classes at school. Parents can help their teens do their homework in the afternoons so that they get the right amount of sleep that they need. Parents can also teach their teens that sleep is important to their health and on their brains. They can have more time spent educating their teen about sleep, and why it is good for their success at school. Teens will agree to sleep rules more if they truly understand the importance of having a good sleep. Teachers should work to assign manageable homework that could be done by the students on time. Many teens around the age of 13, are starting to experience stress that is mainly caused by the large amounts of homework from school. These teens described their homework as tiring and stressful. “A homework expert recommended that multiplying the student's grade by 10 is the same as getting the amount of time they should spend on their homework every day” (Conner). Which means that freshmen in high schools should spend time on their homework for 90 minutes and 120 minutes to those seniors. Instead, teens are spending an average of over 3 hours each night to finish their homework on time. To conclude, having more sleep is important to the teen’s health and causes the brains of the tired teens to restructure, which is crucial for their memories to work. Teens should have more sleep because sleeping also helps the teen’s brains to remember the knowledge they had learned from the previous night. Having not enough sleep is not only bad for the teen’s health but it is also bad for their brains as well. Teens who are about my age should have the right amount of sleep they need every day. I know how it feels like to wake up having not enough sleep because I do it every day. I think that middle school and high school should also start later in the morning to allow kids to sleep in more.